Bolivian navy troops parade during a ceremony commemorating the 134th anniversary of the invasion by Chilean troops to the then-Bolivian port of Antofagasta that triggered the Pacific War. What it’s about: In the navy, yes, you can sail the seven seas. In the navy, yes, you can put your mind at ease. But maybe not that first one, if you’re from a country that doesn’t border water. Ten landlocked countries have navies to protect their shores, but no actual shores, and eight more have no waterfront but naval divisions within other branches of the service, usually the army. Biggest controversy: There’s some debate over whether some of these countries are landlocked. Azerbaijan, Kazakhstan, and Turkmenistan each border the Caspian Sea and no other bodies of water. The Caspian is a rare sea that doesn’t have a waterway leading to the ocean, and is considered by some to be more of a gigantic saltwater lake (though it has only a third of the salinity of the ocean) than a proper sea. Perhaps unsurprisingly, there are ongoing disputes over territory at sea, so all three countries have navies standing ready. Non-landlocked Russia and Iran also border the sea. The former has a Caspian Flotilla apart from its ocean-going navy, but it’s not clear whether the latter has a naval force on the Caspian. Strangest fact: Mongolia’s navy consists of one ship. In the 1200s, Genghis Khan made Mongolia into the largest contiguous empire in history, chiefly by leading armies on horseback. The eastward conquest stopped at the Pacific, as his grandson Kublai Khan built a fleet with the intent to conquer Japan, but nearly the entire navy sank in a storm and the great Khan never made another attempt. So perhaps it’s fitting that modern-day Mongolia has only one ship, the Sukhbaatar III stationed at Lake Khövsgöl, and a navy of seven officers, the smallest in the world. Along similar lines, Ethiopia maintains a navy of just one ship. The country once bordered the Red Sea, but lost its entire coastline when Eritrea became independent in 1991. The Ethiopian Navy soldiered on for another five years using foreign ports, until scaling down to a lone boat on Lake Tana. Children playing in Lake Tana near a reed canoe (not the navy’s lone boat). Thing we were happiest to learn: Landlocked navies can be formidable. Hungary has “one of the heaviest and most qualified” warship battalions in East-Central Europe. As many qualifiers as that sentence includes, it’s still impressive for a country with no coastline. Hungary’s navy is strictly river-based, running minesweepers and other vessels along the Danube. 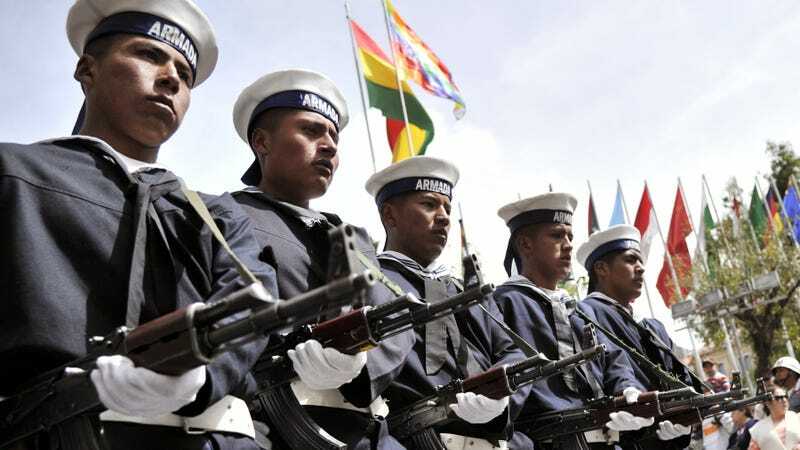 Thing we were unhappiest to learn: Poor Bolivia’s navy exists simply to keep hope alive. The country has been landlocked since the War Of The Pacific concluded in 1884, in which Chile defeated Bolivia and Peru, and claimed a stretch of coastline that included the southern tip of Peru and Bolivia’s entire access to the Pacific. While Bolivia’s navy actively patrols Lake Titicaca, many Bolivians see their navy as a sign that the country hasn’t given up on reclaiming their lost territory. Also noteworthy: Switzerland is steadfastly neutral and is a mountainous, landlocked country, but that doesn’t mean it’s not still ready for anything. The Swiss Armed Forces has a naval division that patrols several sizable lakes throughout the country. Sure, no one’s tried invading Switzerland since Napoleon, and if someone does invade, they’re probably not coming by boat. But better safe than sorry. Best link to elsewhere on Wikipedia: Paraguay’s river-based navy was crucial in winning the Chaco War of the early 1930s. That war, a dispute over oil-rich territory between Paraguay and Bolivia, was the bloodiest in 20th-century South America. Both countries had already lost significant territory in the previous century; Bolivia losing its coastline, as previously discussed, and Paraguay losing nearly half its territory in the disastrous, Rutherford B. Hayes-mediated Paraguayan War. Further down the Wormhole: Besides Bolivia’s lake-bound navy, the country also maintains some ships deployed in Argentina, which is nearly all coast. That country is one of the most biodiverse in the world, with more than 9,000 plant species, more than 1,000 types of bird, and 375 different mammals. As a survival instinct, many mammals are polyphagic, meaning they’re constantly hungry. Many humans could be described thusly, none more so than Tarrare. We’ll take a look at the man who couldn’t stop eating next week.